Tonight will be the cheapest opportunity to go to an NBA Finals game in five years. Yep, if you live in Cleveland and have $235 burning a hole in your pocket, you can get into Quicken Loans Arena for Game 3 of the Golden State Warriors-Cleveland Cavaliers NBA Finals series. 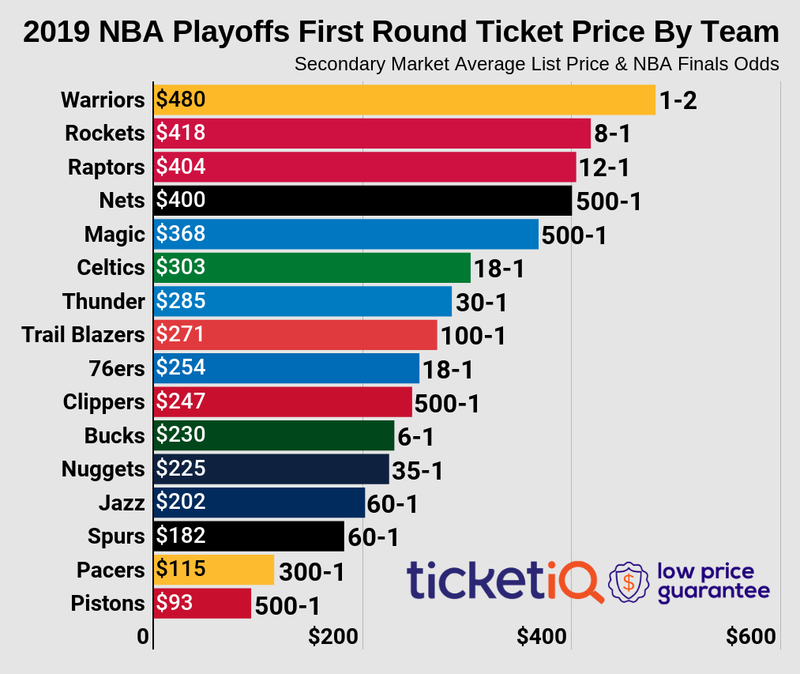 According to TicketIQ.com, the get-in price of $235 on the secondary market is the lowest its been since 2014, when it cost $236 to see the San Antonio Spurs play at home in the Finals. And it is the cheapest ticket of the current series. Historically, there have only been four lower get-in prices on the secondary market this decade -- $225 in 2012 to see a Miami Heat home game, $210 in 2013 to see a Spurs home game, $199 in 2011 to see a Heat home game, and $194 in 2011 to see a Dallas Mavericks home game. The average asking price on the secondary market for a Cavaliers home Finals game is $1,129, making it the eighth most expensive of the decade. But tonight’s Game 3, with an average asking price of $1,032, is the least expensive of the three games Cleveland could potentially host. Game 4 currently has an average asking price of $1,114, and the if-needed Game 6 is sitting at $1,238. Overall, Warriors-Cavs IV is the second most expensive Finals of the decade, according to TicketIQ.com. The average asking price of $1,855 is second only to Warriors-Cavs II in 2016, when the average was $1,931. Throughout the series, the average asking price to see a game Cleveland has been well below the average to see a game in Oakland. Fans paid an average of $1,720 to see Games 1 and 2, and the four-game Oakland average asking price is $2,400 – more than double the series average in Cleveland. A Cleveland Cavaliers-Golden State Warriors NBA final doesn’t seem to get old. At least not from a fan demand perspective. But if all you’re looking for is a seat in the arena when the NBA Finals tips off on Thursday – you’re in luck. According to TicketIQ.com, the get-in price for the series as a whole is the cheapest its been in the last four years. At $390 on the secondary market, the price is $5 cheaper than the 2017 get-in price 23 percent off its peak of $502 in 2016. In terms of individual games, the $305 get-in price for Game 3 at Quicken Loans Arena is the cheapest there over the four series and the $510 get-in price for Game 1 at Oracle Arena is the second cheapest there. After both teams won their Game 7s over the weekend, average asking prices on the secondary market are approaching the highest of the four meetings. As of Tuesday, according to TicketIQ.com, the average asking price for the series was $1,914, second overall to the 2016 meeting, for which fans paid an average of $1,931. Last year’s final had an average asking price of $1,767 while the 2015 version had an average asking price of $1,604. Fans in the San Francisco Bay area are driving ticket prices to Oracle Arena to an all-time high, according to TicketIQ.com. The average asking price on the secondary market of $2,373 blows away the average price at Quicken Loans Arena -- $1,302. For the Warriors and the NBA as a whole, that price is the highest since TicketIQ began tracking data in 2011. For the Cavaliers, the average asking price is the third highest in history at Quicken Loans Arena. The priciest game of the series will be the if-needed Game 7 in Oakland, which has a current average asking price of $3,413 and the priciest in Cleveland is the if-needed Game 6, which checks in at $1,504 as of Tuesday. The defending champion Warriors have won two of the last three Finals meetings, and only the 2016 series, which Cleveland won, went to seven games.